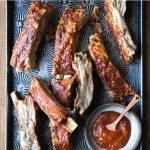 Unlike cooking on the grill or in the oven these pressure cooker ribs do not take all day and they are perfect and fall apart tender! You don’t need any fancy equipment or quirky ingredients to make this recipe, you will need a pressure cooker, I have an Instant Pot and love it! Here are just a handful of the ingredients you’ll need, the full printable recipe is at the end of the post. 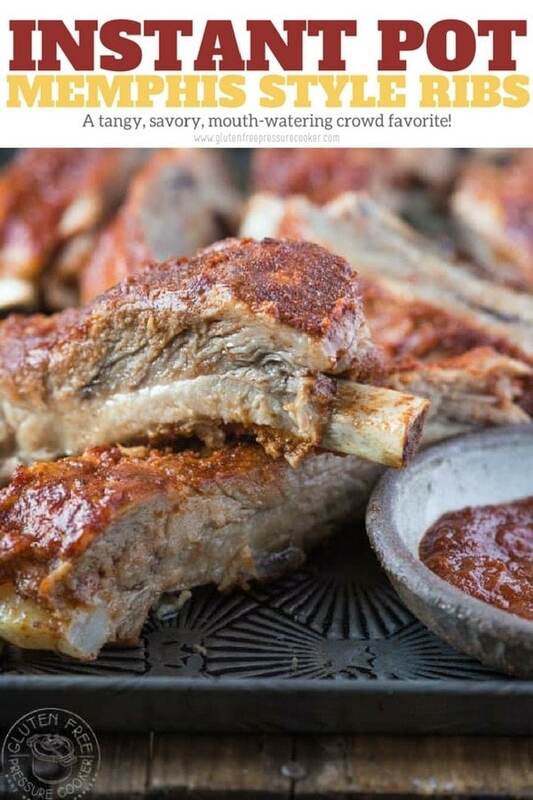 If I’d known how easy it is to make Instant Pot Ribs I would have done it a long time ago! I know purists may scoff at ribs cooked this way and not on a grill but the fact is, it’s much quicker and the ribs are equally tender so that’s a win for me and my family. 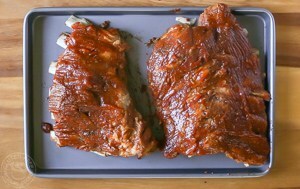 Here’s a simple step by step guide to making pressure cooker ribs, the full printable recipe is further down the post. STEP 2 –If you’re making my BBQ sauce recipe to go with the ribs then I’d start making the sauce now so it has time to reduce down while the ribs are being prepared and cooked. 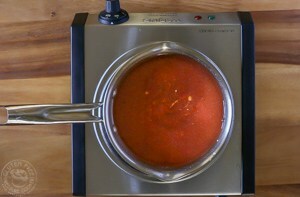 To make the BBQ sauce simply add all the sauce ingredients to a pan and simmer for 30 minutes, or until it thickens up a bit. STEP 3 – Depending on whether you have baby back or spare ribs, you may need to cut the ribs into two or more pieces to fit in your pressure cooker. I could not fit the whole rack of spare ribs into mine, but often baby back ribs can be curled round in one piece inside the pressure cooker. Place the ribs onto the trivet , add water, and cook for 15 minutes for baby back ribs and 20 minutes for spare ribs. 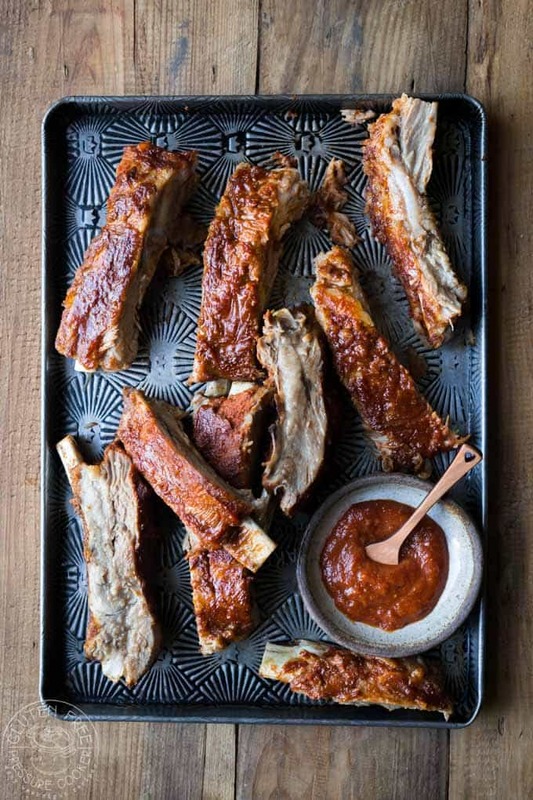 STEP 4 – When the ribs are cooked, put them on a sheet pan and brush them with the BBQ sauce and broil on both sides for a few minutes at a time until they are sticky, take care not to burn them! What’s the Difference Between Baby Back Ribs and Spare Ribs? All ribs are not equal and pork ribs, which is what we are using in this recipe, come from two different places on the pig. Spare Ribs, also known as side ribs come from the belly part of the pig and from the Sparerib you can get St. Louis style or Louisiana style ribs. Back Ribs, also knows as loin ribs or Baby Back Ribs, come from the back of the pig near to the spine. They are not nearly as meaty and full of fat as spare ribs but they are much more tender and they will cook faster. 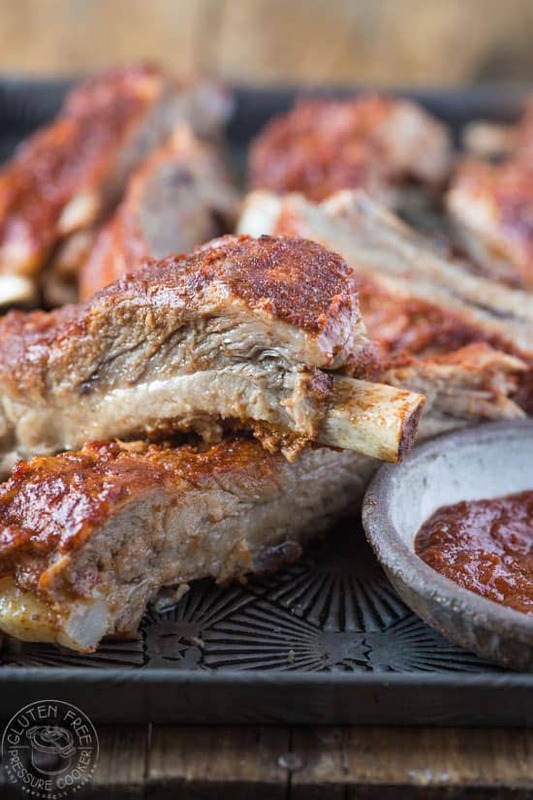 Finger licking good sticky Pressure Cooker Ribs with a Memphis Rub and homemade BBQ sauce! Ribs are cooked in only 30 minutes or less! To make the BBQ sauce simply add all the sauce ingredients to a small pan, mix and simmer gently for 30 minutes or until it thickens up. 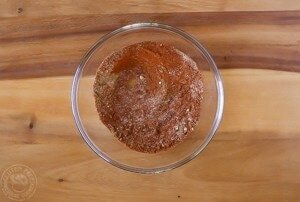 Add all the ingredients for the Memphis dry rub to a bowl and mix well to combine. Make sure you have removed the silver membrane from the back (rib side) of the ribs. You can do this by inserting a table knife under the membrane at one end of the ribs to lift and loosen the membrane. Then, using a paper towel to grip the membrane, slowly peel it back off the ribs. Sometimes it will come off in one long piece, and sometimes it will break apart, so you may need to do it in pieces. If you're still not sure how to do this, there are lots of videos on google that will show you how. 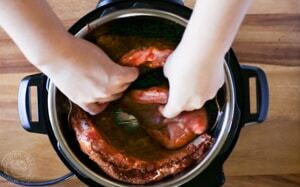 Cut your ribs into two or more pieces to fit in your pressure cooker. Then, generously rub the Memphis spice rub mixture onto both sides of the ribs, you may not need all the rub. Place the rib pieces onto the trivet in the pot stacked on their side. Place the ribs onto a sheet pan (with a sheet pan rack if you have one) and brush with the homemade BBQ sauce, or other gluten free BBQ sauce of your choice. Place the ribs under the broiler for a few minutes at a time to get nice and sticky, you'll need to turn them at least once and apply more BBQ sauce to all sides. I’m not sure what you mean when you say “stacked on their side.” Is it like a picket fence around the pot, or like I’m ready to play Jenga? Maybe a picture of that step would help. Thanks! Hi Jec, it’s wrapped around the inside of the pot, like the fence! You can see it in the photo in the post next to step 3. Or maybe I could just read the whole blog. Oops. Your directions are perfect. Okay, so my 8 year old, my oldest, admitted to licking the roasting pan after dinner when nobody was looking. Those ribs were goooooood! Thanks for the recipe! I did some with just the dry rub, sans brown sugar (for health reasons), and my kids loved that too. We didn’t have ketchup, so we used some Sweet Baby Ray’s on the other half and we sat in total silence at the table for literally 5 whole minutes with our 4 little kids while everyone just basked in the finger-licking deliciousness. Amazing! Yaaaaaayyyyy!!! 🙂 I’m glad you all loved it, it’s such a breeze to make it in the pressure cooker, I really love it that way! And we love Sweet Baby Rays too, it’s my go to brand when I don’t make my own BBQ sauce.